Painting your ceiling can seem like a tough task. But following expert ceiling painting tips and using Benjamin Moore® Waterborne Ceiling Paint can help you get the job done right. While classic white ceiling paint is a go-to for homeowners, why not consider color? A rich navy blue or deep black ceiling can blur the boundaries of a room, making it look endless yet intimate. Painting a ceiling with a lighter shade or a slight variation of your wall color delivers depth and dimension, without breaking the unity of existing color schemes. *Always follow manufacturer's application steps for best results. What's the best way to paint a ceiling? Watch our how-to video for step-by-step guidance on how to paint a ceiling the right way–and get amazing results you’ll love. To get started, you will need a 2½-inch angle sash brush, painters tape, a nine-inch roller, sleeve and pan, an extension pole, a step ladder and Benjamin Moore Waterborne Ceiling Paint. In addition to your paint, make sure your brush and roller sleeve are high quality and that your roller sleeve is the appropriate nap for your ceiling texture. 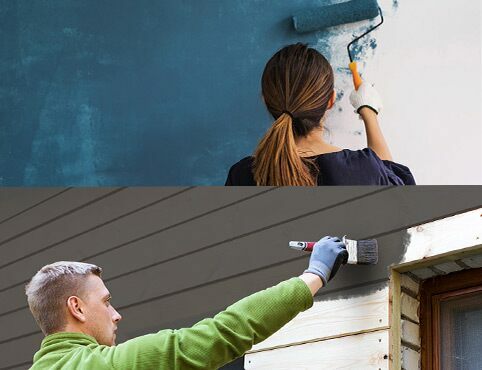 Ask your local Benjamin Moore retailer for help determining the best tools. 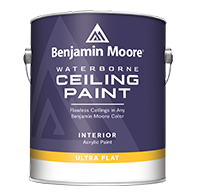 When it comes to the best type of paint for ceilings, Benjamin Moore’s Waterborne Ceiling Paint is a “dead flat” paint that applies smoothly, hides most ceiling imperfections and is specially formulated to minimize both lap marks and splatter. White is a common choice, but you can choose virtually any color to paint your ceiling, as Benjamin Moore offers thousands and can match the shade you desire. A common question is: “What should I paint first, the ceiling or walls?” Always paint the ceiling before the walls, and always cover everything below the ceiling with drop cloths. Try to empty the room completely to make the job easier. Also, try to remove overhead light fixtures. If you cannot remove fixtures, use painters tape to protect them from spatter or use your brush to cut around them carefully. Start with painting the edge of the ceiling where it meets the wall first. Cut the ceiling in like you would cut in a corner. Starting in the ceiling line, brush into the corner and feather paint 2-3 inches and down onto the wall. If you aren’t going to paint the walls, use painters tape to protect the wall or use the brush to cut in a nice straight line along the wall’s edge. Switch from brush to roller to start painting the rest of the ceiling. Start from the corner of the ceiling and start rolling nearest to a window, so that you can see the light from the window reflecting the wet paint. Then work your way across the room, rolling slowly when you’re near the wall to help avoid hitting it. Each time you load your roller, start on an unpainted area and work back into a painted area. Paint the ceiling in one session, so the paint dries uniformly. Wait for the coat to dry to determine if a second coat is needed. Check the label instructions for dry times. Your ceiling is refreshed and ready to fit in with the rest of your home’s interior design. An ultra flat finish designed to hide common ceiling imperfections for a look that is virtually flawless.